How successful is your municipality in achieving the Sustainable Development Goals? Check it out on the SDG-Portal! More and more municipalities are realizing that the path towards the future cannot be tread without paying attention to sustainability. Only few know about the 17 Sustainable Development Goals and their 169 sub objectives and there are no reference points for benchmarking. Sustainability necessarily starts within the municipalities, as they form the basis for the implementation of the SDGs. It is there where people live, work, spend their leisure time, and where they have their friends and families—the concern for sustainability is thus of vast importance. Ultimately, it is up to the cities, counties, and municipalities, whether the sustainable development will be successful. For this reason, the manner in which communities address sustainability and the implementation of the SDGs is of central importance. But how can this be done? Our first answer: A universal set of 47 core indicators for all SDGs and sub objectives, which support municipalities in assessing and monitoring progress and development towards achieving the SDGs. Our second answer: An easy and intuitive approach towards them. 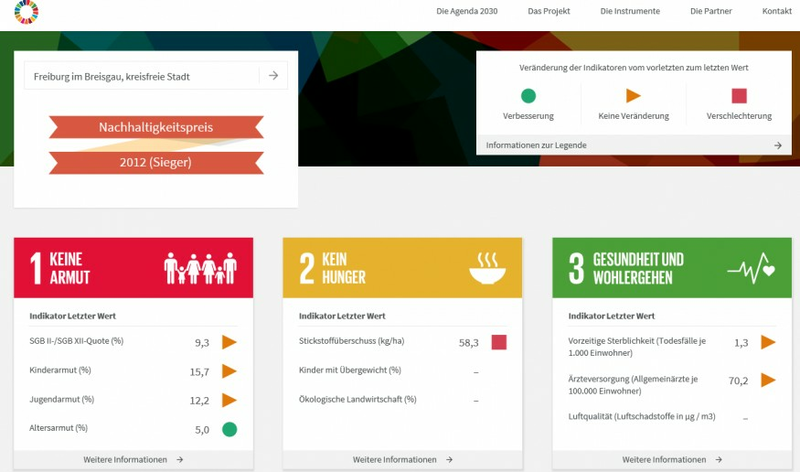 For that purpose, the Bertelsmann Stiftung and its cooperation partners have turned their SDG indicators for municipalities into a website: the “SDG-Portal”! The SDG-Portal visualises the municipalities’ progress on their way towards sustainability illustrated by indicator-based data (for municipalities larger than 5000 residents). Not only does it provide an insight into the past years’ development, but it also offers the possibility to compare one municipality’s data with another. The portal facilitates a databased approach towards the SDGs, not only for interested citizens, but also for mayors and local politicians who are now enabled to monitor their work progress. It serves as a common ground and is a helpful tool for policymakers who are responsible for future sustainability strategies. It endows municipalities with the necessary tools to approach a sustainable future. The working group consists of representatives from the Bertelsmann Stiftung, the Association of German Cities, the German Federal Institute for Research on Building, Urban Affairs and Spatial Development, the German County Association, the German Association of Towns and Municipalities, the German Institute of Urban Affairs and Engagement Global. The cooperation roots in the development of indicators for municipalities, which was terminated in 2018, and has been carried on since in the ensuing set-up of the website, pursuing a complex but common goal while bringing together many stakeholders: Putting sustainability on the municipalities’ agendas.